After we had our mid morning snack of dim sum at Tai Thong in Cintra Street, we walked a bit. We passed by this deep fried oil crullers shop. 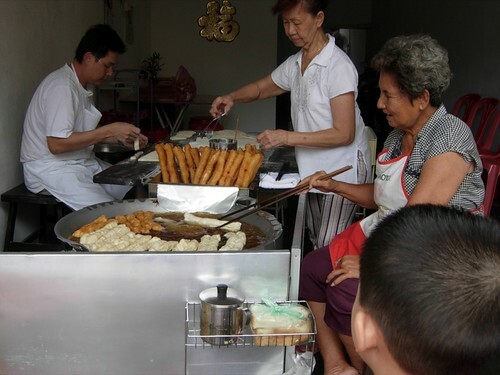 Yau char kwai or oil fry ghost. I immediately remember the post from Penang Tuapui. And I couldn’t help smiling because they cussed the guy who was sitting there relaxing. The guy is again sitting there, relaxing by reading his newspaper. It is funny because it is like from Penang Tuapui post to my encounter this morning, he had been doing nothing but sitting there reading the papers. The oil they use today seems very ‘clean’ and not those dark, dark, thick, thick goey stuffs. So, I bought two pairs of the yau char kwai. 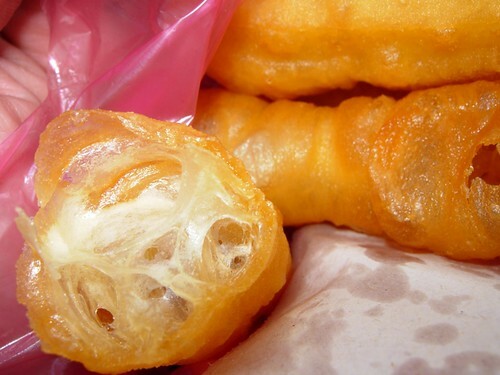 So oily can die. But it is so crunchy and hot. 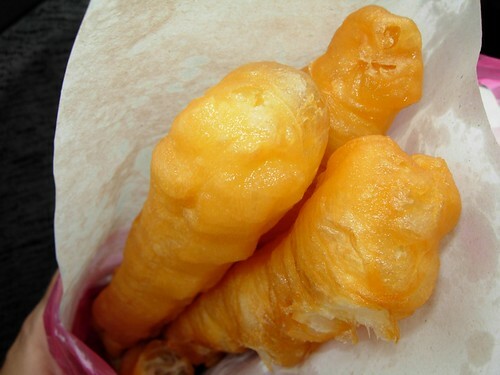 Once in a blue moon, eat a little bit, ok lah. The guy reading the paper’s duty is just to pack and collect money. Then, he went back to reading the newspapers again. I took out my camera and started taking photos and was waiting for him to scold me or something. But he didn’t. Maybe because he thinks I am taking pictures of my son who was fascinated with the suddenly swelling of the eu char koay in the hot oil. 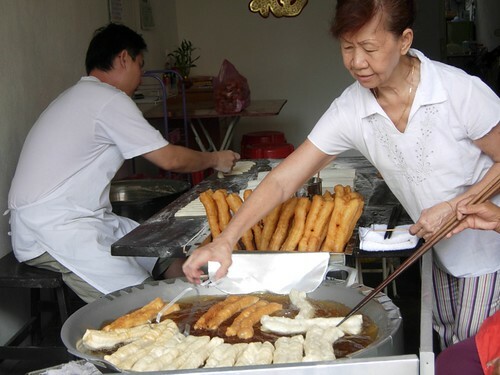 Across the road, there is a biscuit shop that sells traditional biscuits and mooncake type of ‘ang kong nga pneah’. I bought some egg tarts and coconut tarts. I am not sure if the egg tarts are good because my children ate them all and they say, “ok lah…”. However, the coconut tart wasn’t that good. I am still searching for a nice coconut tart. 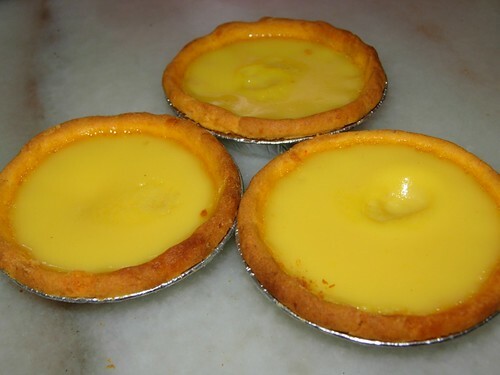 Anyone knows where to find nice coconut tarts like those egg tart type, please let me know ya? I havent been to penang jetty there for ages but the row of small small stalls there (where pedestrians had to walk pass to go up the ramp to board the ferry) used to sell fantastic coconut tarts like those egg tart type. perhaps the next time u hang around chew jetty u can stroll over to take a look. wahlau!!! i just read from pg tuapui that the yau char kwai cost rm1 per piece!! if the oil don’t kill me i think the price can do a good job!! I was looking for Durian Pengat recipe when I found your site again, Lillian. You are really everywhere. constance – Hahaha, I polluted the WWW with all my blog posts. No one can run away from stumbling on my blogs. Just joking. Cintra Street is still as charming, with nice ham chim peng at night. sooi2 – Yalor, everything is so expensive nowadays. Even economy foods costs RM6-7 per plate. Will look out for the tarts. Tks. Iris – They have some frozen type but I have never try before. Wei, I wonder what will you reply if the “bo lok yong” guy scold you of taking pics. I had the feeling you were prepared to shoot back lah… right?? ?